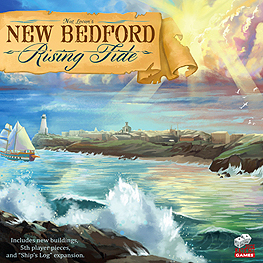 "There is, one knows not what sweet mystery about this sea, whose gently awful stirrings seem to speak of some hidden soul beneath..."
A rising tide lifts all boats, and in New Bedford that means the town is ready to grow. Rising Tide includes more ships and supplies for a fifth captain, and even more buildings to expand the town. Ships at sea will have tales to tell from the Ship's Log, and while Providence favours the bo. ld, darker Omens are also on the horizon Catch the Rising Tide to take your game to new heights before the water is over your head. Requires the New Bedford core game to play.